Home > Baby at Home > Why is My Baby Crying? In the beginning, babies have only one way to communicate -- they cry. Many parents, especially first time parents, can have a difficult time trying to decipher their baby's cries and figure out what it is that baby needs. With time, however, most parents begin to understand and can usually anticipate their needs. There are a number of factors responsible for making babies cry and taking a look at the most common reasons may help parents to soothe their fussy babies. The most common reason that babies cry is hunger. Babies, especially very young ones, need to eat small, frequent meals. Because of this, many new parents feel like they are constantly feeding their babies, but this is perfectly normal. When in doubt, try offering a crying baby the breast or bottle to see if that settles them down. Is it Time For a Nappy Change? While some babies never alert you when their nappy is wet or soiled, many will wail loudly when they need changing. Keeping a baby's bottom clean and dry will help alleviate this problem and is healthy for baby's sensitive skin, too. Discomfort - Too Hot or Too Cold? Many babies are sensitive to temperature changes and will let you know immediately if they are feeling too warm or cold. Be especially careful not to over-bundle your baby since overheating is a risk factor for cot death. In general, babies need one extra layer of light clothing than adults to feel comfortable. If your baby is sensitive to being chilled, you may notice that crying increases during bath time and nappy changes, when the baby's skin is exposed. If this is the case, try to bathe and change your baby quickly to minimize discomfort. As the baby gets a bit older, this problem will take care of itself. Some babies need to be held or rocked more than others. As you get to know your baby, you will learn what it takes to make him/her feel secure, but in the beginning, it is better to hold your baby quite a bit. Babies usually enjoy the comfort of a parent's arms and the sounds of familiar voices. Reassure your baby by snuggling close and talking, reading, or singing. While some babies simply fall asleep wherever and whenever they get tired, others have a difficult time relaxing and drifting off to sleep. This is especially common when there has been a lot of activity around the baby as many times they get overtired and over-stimulated by lots of visitors and attention. Oftentimes, overtired babies will have what sounds like an angry cry. While most of the time, baby's cries are expressions of simple need, babies who aren't feeling well will often cry even after they are fed, changed, and well rested. Cries that sound especially urgent or those that are uncharacteristically weak may signal illness, so if you are concerned, check with your GP for advice. Fever, vomiting, diarrhea, or constipation in young babies should always be reported to the GP. Try not to worry, though, since more often than not, everything is fine. 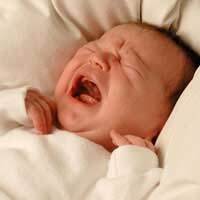 Unexplained bouts of crying, sometimes lasting for hours, may be colic. Colic is typically defined as crying that lasts at least three hours a day for at least three days a week. That sounds like a lot and it feels like an awful lot to concerned parents, but colic is not a sign that your baby is ill. Some babies merely have a greater need to cry than others and while this can be stressful for parents, colic is outgrown without any interference at all, typically within three months. While it is reassuring to know that within a few months, babies will be able to express themselves in ways other than crying, all parents want to help their babies to feel safe, secure, and comforted. Some babies like to be snuggled near their mum or dad, so placing baby in a sling may help. Rocking or gently swaying your baby may be soothing, as is soft music. Many babies enjoy going for a walk or a drive in the car and experienced parents will often tell stories of taking their fussy little ones for a drive just to lull them to sleep. Finally, many babies take comfort in sucking on a pacifier. Virtually all new parents experience feelings of exhaustion and frustration at times; it is important to remember that it will get easier to understand your baby's needs. Parents should not feel guilty about taking time to look after themselves, too. Eating well, exercising, and making an effort to maintain a social life are all ways in which parents can help themselves to be relaxed and ready for the many demands of parenting.